USB Over Network consists of both a Server and a Client install. You install the Server part on the machine to which you want to connect the device and the Client version then needs to be installed on all the machines from which you want to access said device. Both installs are straightforward. Server-side, it's easy to create a USB share and, depending on how many device licences you have bought, it's also easy to swap which device you are sharing. Client-side, it's even less hassle. Once installed, it launches a quick start that guides you through the basics. In addition you can automatically connect any USB device shared on that server. You'll easily have devices shared across your network in minutes. 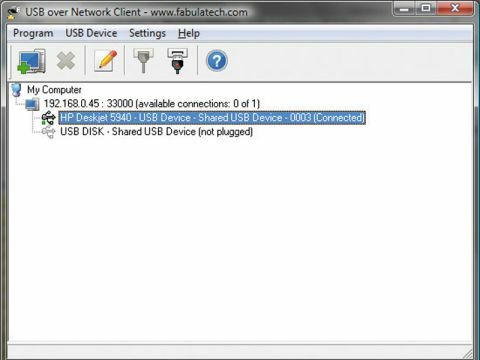 FabulaTech's USB Over Network is a reliable choice a very specific need. However, the prohibitive price per device (and the fact that there are plenty of alternative methods) makes us wonder if anyone will ever find a reason to use it.